Social justice issues concerning race, surveillance, and militarized borders have been the major focal points of my research. My work is extremely diverse both in substance, form, and media and can be roughly divided into “The U.S – Mexico Border Project” (2007-present) and “Textiles: A Metaphorical Tracing” (2012-present). Both bodies of work focus on archives, considering how they shape our histories, whose narratives get included, and whose narratives get left out. includes photographs Harbage Page took at the U.S./Mexico border along with found objects (shoes, wallets, eyeglasses, toothbrushes, toys) dropped by immigrants in their haste to get across or escape the border patrol. Professor Harbage Page is an assistant professor in the Department of Women’s and Gender Studies at UNC-Chapel Hill, and teaches courses in art and social change, borders, feminist thought, photography, and identity and gender in contemporary art. The place where an artist is based can significantly impact their work. Similarly, artists influence their communities in profound ways. With a focus on artists from North Carolina, Creating Community: We Are All Here explores the relationships between artist and place. This installation considers the work of artists who immigrated to North Carolina, as well as those originally from the state, and the many ways that community may be represented through photography, sculpture and textiles. Hubert Walters (maker of boats and birds), photograph above, Susan Harbage Page 1995. The exhibition includes work by Michael Jenkins, Susan Harbage Page, Silvia Heyden, Hubert Walters, Jerstin Crosby and Bill Thelen, and Burk Uzzel. Looking forward to participating in this roundtable of creatives from various fields. Museo Palazzo Mocenigo, Venice. In collaboration with MicroClima. 18 May, 6 pm. Organized by curator Cornelia Lauf. Exploring the photography collections of nine North Carolina art museums, the exhibition Created by Light showcased over 100 photographs highlighting both the pioneers of the medium and contemporary artists working in the field today. The exhibition opens to the public at the Cameron Art Museum in Wilmington on September 16, 2017. CAM invited eight North Carolina art museums to participate in this collaborative exhibition, asking each to curate which photographs to feature from their permanent collections. One museum focused on Bauhaus works created between the world wars, another curated a body of work by North Carolina photographers, while others chose work by such well-known artists as Robert Mapplethorpe, Andres Serrano, Susan Harbage Page, Mickalene Thomas, Burk Uzzle, Edward Weston, Aaron Siskind, Francesca Woodman and Ansel Adams. First artwork of the new year.. A work I’ve been considering since Trump announced his travel ban. My old passport gold-leafed—thinking about what it means to have access. Why goods, culture, technology can all cross borders seamlessly and bodies cannot. What does it mean to have a passport? Who gets to decide if you have one? What privilege it brings me? What it means to hide behind wealth? How does this privilege both obscure and reveal who I am. What it means to walk on the U.S.-Mexico border using my U.S.–Passport to stay in the same place that others are throwing out their passports and identity cards to remain in. How many times I placed these pieces of paper, this tiny book with stamps, securely in my pocket or backpack, counting on them to keep me safe. What it means to belong? I find the figurines forlornly sitting on the shelves of local thrift stores and antique malls. Many of them reference English society of the 1800s, but imprints and markings declare “Made in China” or “Made in Korea.” They evoke the dolls my grandmother made me as a child, with cloth bodies and ceramic heads, hands, and feet, or the Topsy-Turvy dolls with a white woman on one side and a black woman on the other, separated by a skirt, and the shelves of my childhood bedroom filled with collections of ceramic horses, bunnies, and kittens produced to be “looked at.” They also call to mind the downstairs closets of my childhood, which held the bulky two-part plaster molds that my mother and grandmother used to make porcelain figurines, reproducing identical female forms, each one poured, dried, and fired in a small kiln, and then meticulously hand painted with dresses in pastel blues, pinks, and greens. 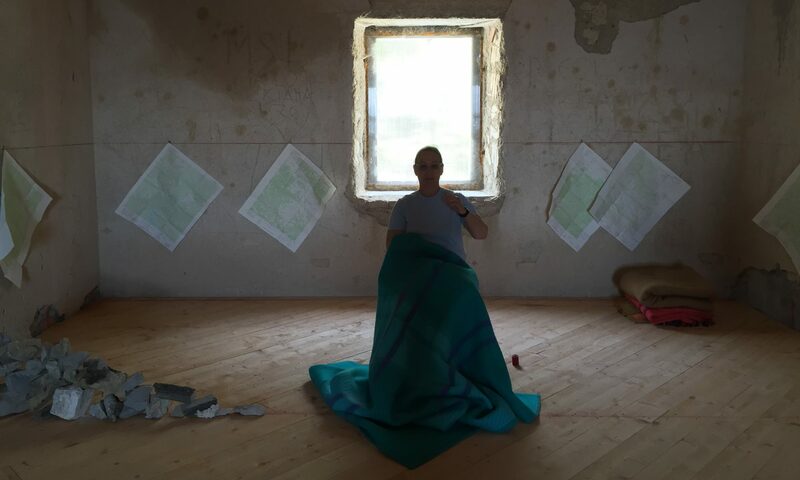 Migrant’s Lament: Sewing Politics into Geography, a site-specific installation and performance (30’ by 24’) in the Ex Casserma Monte Rita (military barracks) for the international Biennale Arte Dolomite, is a meditation on the increasing number of border walls throughout the world. Over forty border walls have been constructed in the wake of 9/11 and the Arab Spring. Record numbers of (im)migrants are in movement in the U.S., the E.U., the Middle East, and North Africa, challenging the limits of our global world’s hospitality and compassion. Millions of immigrants are vulnerable, sleeping outside in tents and blankets, experiencing and suffering the lived reality and trauma of decisions made by far-away leaders, thinking about resources and protecting what they already have—instead of people. In the installation Migrant’s Lament, I literally sew politics into humanity. I sit in the middle of the room on a pink chair and sew a dotted red line into a blue blanket. The action/performance references the millions of individuals that are affected by the construction of nation-state borders. In the installation, topographical maps hang from a red chalk line around the room. The red line, a representation of life, unites all of the maps. The maps depict a region that was once a part of Mexico but now belongs to the U.S. as a result of the treaty of Guadalupe Hidalgo. Signed in 1848, the treaty established the Rio Grande as the boundary for Texas, giving the U.S. ownership of California, half of New Mexico, most of Arizona, Nevada, Utah, and parts of Wyoming and Colorado. Mexicans in those areas had the choice to relocate within Mexico or stay within those boundaries and receive American citizenship. In addition, I added various markings and text on the wall with chalk including words like “appartenere/belonging,” “here,” “there,” and symbols including arrows and a white box, referencing privilege. The entire room is marked with a waist-high red line as a boundary or border marker. I wrote the names of countries who have constructed walls to keep people out above the line, and the country on the other side of the wall below the line, for example: Israel/Palestine and India/Bangladesh. I left chalk on the ground floor of the installation and audience members added to the text and wall markings throughout the exhibition. In the corner of the room, the viewer finds a carefully folded pile of wool blankets representing our global world and the compassion and care we need to summon in support of individuals at this pivotal moment. The installation questions borders and their creation with an unfinished rock wall built on a red chalk line drawn on the ground. The viewer remains unclear about this wall. Is it being constructed or deconstructed? It asks the viewer to think deeply about what is happening in our world today. Over 90 paintings and drawings which explore 14th -16th century indigo Blue Umbrian weavings These Indigo blue and white Italian textiles were initially highly valued and sometimes used as altar clothing. Over time, they became everyday working linens including tablecloths, dishtowels, and rags. This series also explores handmade crocheted and lace collars as well as meditation involved in the making/production process.